The pictures are like a time machine, taking us back to 1965, when the term ‘outlaw’ referred more to being unconventional or rebellious than ‘outside the law’. It’s worth linking over there to have a look at some great pictures. The whole scene, the choppers from that area, it's just great to see. 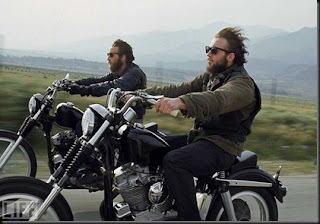 It's history, a time when choppers were real choppers, and riding them was a way of life. Bill Ray captured the spirit and made these famous pictures, most of them in black and white. See them, you'll love them!